So it’s a dip. And a sandwich spread. 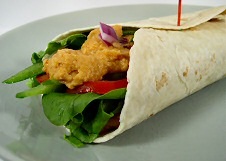 I ate it for lunch in a wrap, along with lettuce, spinach, tomatoes, green pepper, and red onions. For our end-of-the-workday Cinco de Mayo snack, we ate it as a dip with crackers. Either way, if you like spicy foods, you’ll probably love this. And if you’re trying to cut out fat, this recipe’s a winner: with all that spiciness, you won’t miss the tahini. With the food processor running, drop in the garlic and process until chopped. Add the chickpeas and lime juice and begin processing. 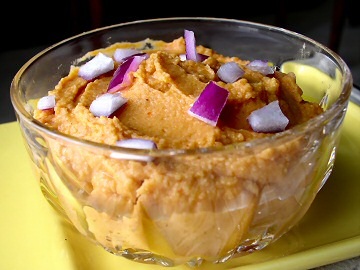 If it’s too dry, add 1-2 tablespoons of cooking liquid from chickpeas or, if you’re using canned, just use water. Add the remaining ingredients and process until smooth. Adjust salt to taste. Serve garnished with chopped red onions. Nutrition (per serving): 136 calories, 11 calories from fat, 1.3g total fat, 0mg cholesterol, 361.2mg sodium, 241.8mg potassium, 26.2g carbohydrates, 5g fiber, <1g sugar, 5.6g protein, 3.8 points. I'm 33 w/ an 8, 3, and 11 mo. old kids and trying out the vegetarian/vegan lifestyle. We don't particularly like veggies or beans 🙁 I've tried a couple of veggie recipes that didn't work for me or my family – I was thinking maybe I should give up when I decided to try this. It was a hit! The first time, I followed directions, only subbing V8 for the tomato paste since that's what I had. I got the 3 yr old to eat it (a thin layer) on a flour tortilla w/cheese rolled up. The idea btw, from a another of your recipes! The second time, I was more liberal w/the chipotle, lime, and seasonings. I mixed in a little sour cream to the mixture, slapped it on a tostada, topped with cheese(for the 3 yr. old), lettuce, tomato, salsa (for the 8 yr old). The ate all of it! My food critic(8 yr. old girl) gave it an A plus ! :) I now have hope. Thanks for sharing the wisdom! I have a feeling this will become a staple and plan on trying other recipes. BTW, I really like when you say if a recipe is a really good, decent, or so so. I haven't seen anyone else de that! Printing and trying this! Another winner I am sure!!! Thank you for making eating-on-the-go delicious! I’m a working graduate student and I need to pack several lunches and dinners throughout the week to eat between classes and shifts. It’s really hard to find food that I can get excited about. This is my first recipe from your site and I *love* this dip and wrap. It’s so tasty and fits my lifestyle perfectly. Thanks again! I’m looking forward to trying more of your recipes! Delicious!!! Just made this for a party. I plan to serve with chips and veggies. Chipoltle pepper is just not something I’ve ever seen in recipes, but I’d like to try this. Can you suggest a substitute I might be able to find here? I’m not sure what it tastes like or if it’s much different than other peppers. Oops! What I meant was it’s not something I’ve ever seen in AUSTRALIA! LOL I’ve seen it in lots of recipes. Hi Anna, chipotles are smoked jalapeno peppers, and they taste smoky and spicy at the same time. You can use any hot red pepper or a hot smoked paprika to get a comparable flavor–or any combination of ingredients that will add a little smoke and heat. I loved this spicy dip! I live in Mexico and can’t get enough chilis so this was perfect for my taste buds and without fat. AMAZING! I also added some chopped up cilantro and it made for a really tangy sauce. Great with baked tortilla chips, pita chips and veggies! YUM YUM! So yummy, perfect amount of spice. Thank you for the great recipe! Just wanted to drop you a quick line and tell you how much I appreciate your recipes. Because of medical reasons I have had to switch to a fat free plant based lifestyle and too many of the other vegan recipes and sites include oil or include ingredients that contain too much oil, so I was pleased to find yours. Just wonderful!! I have now tried several of your soups/meals and they were really good. Thanks again for making this available to people looking for a fat free plant based diet. Just starting out on my vegan journey and I love love love this recipe! Can’t wait to try it out. As a new vegan (two months) I am so happy to find your website. The recipes are amazing, even my meat loving friends loved the Black Bean and Sweet Potato burgers I made at the weekend. This dip/spread is delicious and ten minute preparation time is too much even including all the washing up. Thanks again. Hi Susan, Have followed you for 3 years but decided to scan back to the beginning of your blog and work my way through – Julie & Julia-style! This is an amazing dip, slathered it on a wrap with roasted corn/zucchini saute and sprinkled with cilantro. SO delicious, thank you. Have you been able to find oil-free canned chipotles?